Sin Zin is the original California classic and half bottles make it perfect for any occasion! 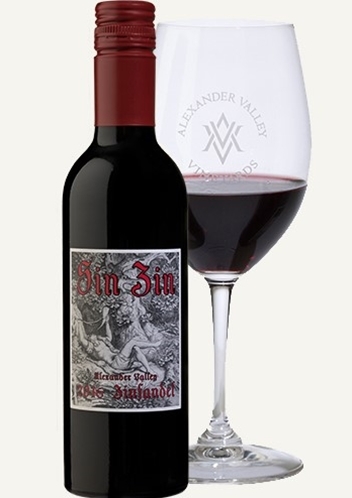 We've been making Sin Zin for 39 years and 2016 is one of the best. Overall, 2016 was a more normal growing season than the last few years. We received much needed rain over the winter and early spring. The good weather continued through the summer with no damaging heat spikes. Harvest started and ended early, with lower yields, but the quality and flavor of the grapes were stellar. Harvest occurred from September 3 - 28, 2016. The 100% Zinfandel was aged for 14 months in American oak barrels. This wine has great color, with a dark purple, red hue. There are spicy, earth aromas of dark fruits, black cherry, black pepper, plum, raspberry, oak and vanilla. While the bottle is small, the wine is big! It has rich mouthfeel and earthy, spicy flavors of black cherry, plum, black pepper, apricot and chocolate. The spicy finish really comes through as the wine sits in the glass with additional nuances of brown sugar and warm spices.